An Opinion On Sports: John Daly: Another "Kodak Moment"! Whoa, Big John! What did that Aussie tree ever do to you? Ho hum, Daly's at it again. 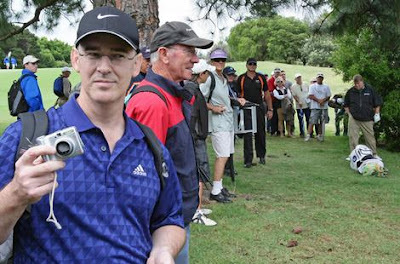 On his last hole of yesterday's Australian Open golf tournament, John Daly threw a spectator's camera into a tree after the spectator, Brad Clegg (above), snapped a shot at close range to the hefty golfer. In fairness to Daly, Clegg admitted to seeing the "No Camera" signs on the course. The golfer had gone to play his stray tee shot in the trees when the incident happened. He finished his round with a "smashing" 78!